Miss Stylish Katz picked up ANOTHER title just after her win at the Arbuckle Futurity! She and Adan rolled into the Cattlemen’s Derby & Classic to claim the Open 5/6 Reserve title with a score of 221, adding another $13,000 to her record! They kicked off the first go with a solid 219 and came back with a 219 to make the finals. Bred by Glenn and Debbie Drake of Napa, Calif., Miss Stylish Katz is out of Reys Desire, a leading daughtery by Dual Rey and earner of more than $400,000 that was a two-time NCHA Super Stakes Champion. Not far behind Adan in the lineup at the Cattlemen’s was Tarin Rice and HR Cats Starlight. They finished third in the Open 5/6 finals in Graham with a 220 and won the Gelding Incentive. HR Cats Starlight (High Brow Cat x Nurse Gray x Grays Starlight) is owned by EJ Huntley who won the Non-Pro at the event last year on the horse! 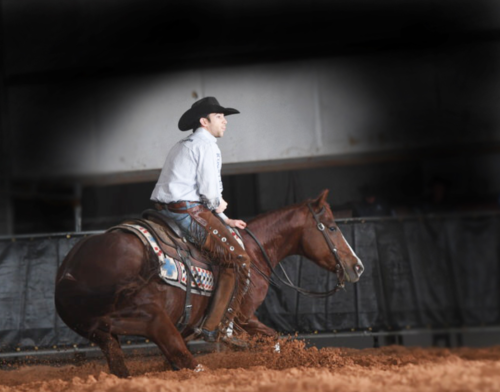 The pretty sorrel gelding started his career off making the NCHA Futurity Non-Pro semifinals and the Amateur finals with Huntley as a 3-year-old. Tarin has since made numerous finals on the horse and was the 2017 Breeder’s Invitational Co-Champion on him with a 224.5! To date, HR Cats Starlight has earned more than $150,000. Other Open finalists included Mr Stormy Cat, ridden by Chris Bates, and Chromed Out Cat, ridden by Spud Sheehan. Congrats also to the Open Derby finalists: Beau Galyean and Cheshire The Cat, Russ Westfall and RN Starlights Cat, Spud Sheehan and Candi Cat & Prowling, and Pedro Ornelas on Little Jo Cat!